Randolph Engineering P3 Shadow - Bright Chrome / Blue Need Help? The P3 Shadow is the evolution of the classic P3 style. Handmade in the USA, it features well-proportioned circular lenses, and a brow-bar to complete the iconic shape. 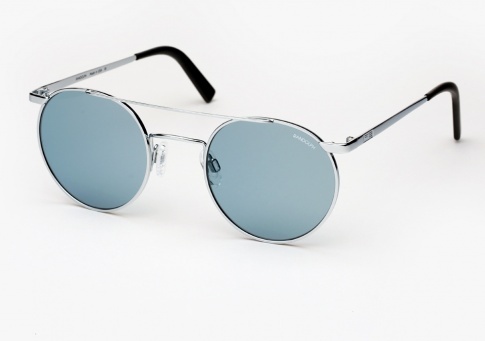 It is offered here in Bright Chrome with Randolph's signature light blue glass lenses. Besides aesthetics, studies have shown blue lenses to have a calming effect on the wearer. The grey blue tint enhances contours around objects and reduces glare. This ease in viewing experience seems to invoke less stress on the eye for longer time wear. Additionally a hydrophobic coating was added to the blue lenses. Hydrophobic simply defined means "afraid of water." The specially designed coating facilitates the run-off of water droplets from the lens surface whether from sweat or from an aqueous environment or in the rain. The coating also lends itself to the aid of cleaning your glasses making it quicker and easier to remove smudges. Comes with an "Equipment Maintenance Kit." Can be made with an RX, contact us to inquire. Handmade in USA using the finest components found worldwide.